Trumpeter Don Cherry is best known for his days with tenor sax legend and free jazz pioneer Ornette Coleman. He is also the stepfather of Neneh Cherry and father of Eagle Eye Cherry. But he recorded plenty of great music as a leader. He was born Feb. 18, 1936 in Oklahoma City. His dad played trumpet and owned the local club Cherry Blossom. He moved with his family to Los Angeles in 1940. His dad was a bartender at the Plantation Club on Central Ave. and that's where the jazz scene was in Los Angeles. Cherry attended Fremont High School. After skipping school to play in the swing band at Jefferson High School, Cherry was sent to reform school where he met drummer Billy Higgins. They became life long friends and collaborators. In the 50s, Cherry was in Art Farmer's band and he jammed with Clifford Brown and Max Roach. He toured with sax player James Clay and they became life long friends. Cherry first worked with Ornette Coleman in 1958 and along with bassist Charlie Haden and drummer Billy Higgins, they invented free jazz with albums like The Shape Of Jazz To Come on Atlantic Records. In 1961, Cherry recorded The Avant Garde with sax legend John Coltrane. They recorded the Thelonious Monk song Bemsha Swing. In the 60s, Cherry toured with Sonny Rollins, Albert Ayler and George Russell. He was also a member of The New York Contemporary Five with Archie Shepp and John Tchicai. He recorded as a leader for Blue Note. Cherry moved to Sweden in the late 60s. Neneh and Eagle Eye Cherry were born in Sweden. He was a member of Old and New Dreams with Dewey Redman, Charlie Haden and Ed Blackwell. They recorded several albums for ECM. Cherry also explored World Music with percussionist Nana Vasconcelos and sitar player Colin Walcott as Codona. They also recorded for ECM. 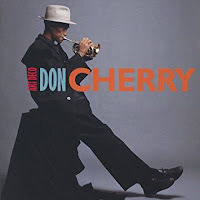 In the late 80s, Cherry signed with A&M Records. He recorded Bemsha Swing on the 1989 album Art Deco. This album was a reunion with sax player James Clay who he toured with in the 50s and he also reunited with Charlie Haden and Billy Higgins. You'll notice Cherry doesn't play a normal trumpet. He plays a pocket cornet. It's amazing the sound he gets from that little thing. Don Cherry died of liver cancer on Oct. 19, 1995 at age 58. Here's Don Cherry performing Bemsha Swing with Herbie Hancock on piano, Ron Carter on bass and Billy Higgins on drums on New Orleans 1986.